Together with Konrad Lorenz, Niko Tinbergen is generally acknowledged as the founder of the young science of ethology. Professor Tinbergen has spent a lifetime of research exploring the behavior of many types of animals in their natural environments, and has founded centers of worldwide renown for research and teaching in the behavioral sciences, first in his native Holland and later at Oxford. His influence extends far beyond the borders of Europe and of zoology proper, and he has contributed substantially to international and interdisciplinary collaboration.Tinbergen's work has been characterized by many as a "breath of fresh air" in fields that were in danger of losing touch with nature and of becoming bogged down in theory. He has tirelessly worked for the use of scientific methods in the study of human behavior, both normal and abnormal. Without shying away from quantification and measurement, he has made his main contribution in what Sir Peter Medawar calls "creative observation" and in the design of meaningful experiments, even in the seemingly chaotic and continuously varying conditions of the natural habitat.In following him in what Tinbergen likes to call his seemingly aimless wanderings, the reader will catch a unique glimpse into the workshop of ethology. Even when reporting on sophisticated experiments, or when developing new theoretical concepts and arguments, Tinbergen writes simply, lucidly, and precisely. 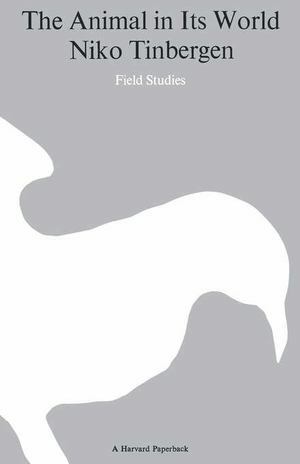 The present volume spans forty years of pioneer investigation and includes selections on the behavior of gulls; on the homing, landmark preference, and prey findings of the digger wasp; on the food hoarding of foxes; and on creatures living scattered as a defense against predators.These classic original studies will fascinate the increasing number of readers interested in the topical problems of animals and human behavior.